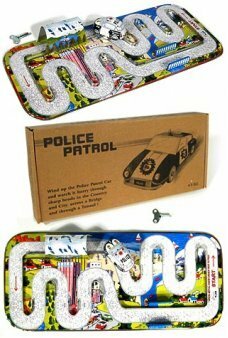 Tin Toy Car Action Sets feature a metal track on a flat tray where your wind up car moves into action. 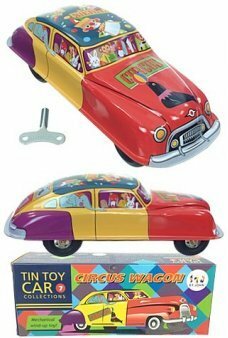 These tin toy sets were popular automobile toys before the introduction of plastic tracks and battery toys. 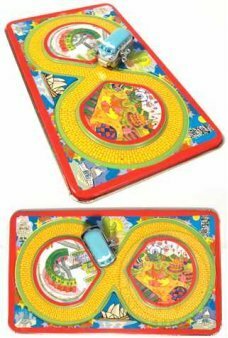 Our original Skyway Set features a unique amusement ride that actually lifts the passengers for a fun and futuristic, ro..
Our colorful Circus Wagon Windup features happy clowns and animals riding in a retro automobile. 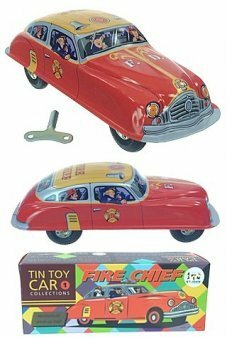 The red, yellow, ..
Our high quality Fire Chief tin toy car features a wind up engine and detailed body. 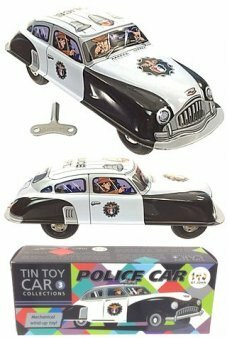 This red and orange tin autom..
Our high quality Police Car features a cop and cowboy riding in this all tin toy City Cab. 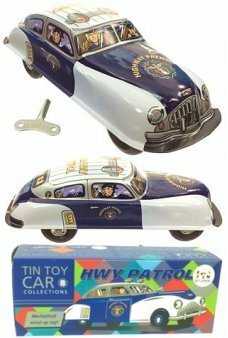 The White and Black tin..
Our high quality Highway Patrol Car features police officers crusing in this all tin retro automobile. The Wh.. 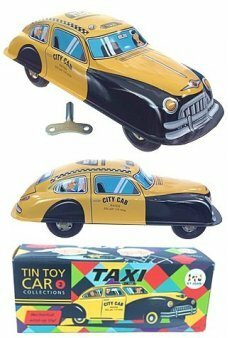 Celebrate trips around the world with this classic tin toy set. Just wind up our cute VW Bus and watch as it twists and .. The Circus Train is always on time! 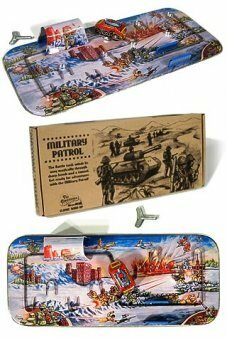 Wind-up the train station and watch the blue and orange trains move in and out of th..
Our Sherman Tank features green camouflage and a long 76 MM gun. 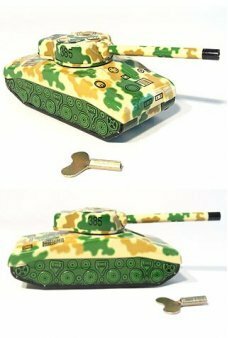 Wind the tank and the Gun moves from the middle to the .. Imagine driving down Park Avenue in our Tuxedo Black Limousine Classic Car. 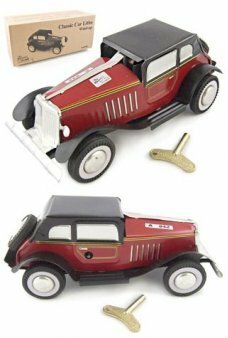 Just wind up the Antique Automobile and rele..
Schylling Motor Works makes this beautiful reproduction of the Japanese tin toy vehicle from the 1950’s. Featuring chro..
Go back in time with our Handsome Red Classic Car . 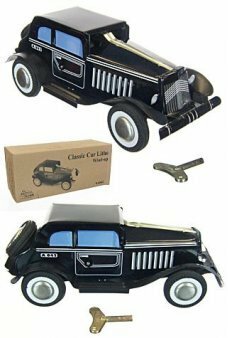 Just wind up the Antique Automobile and release the axle lock to sta.. 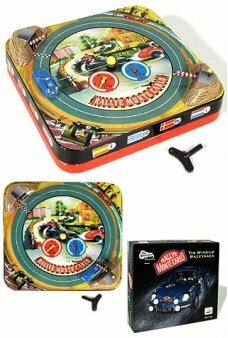 Play our beautiful and unique animated tin toy Rallye Monte Carlo wind up racetrack game! Just wind up our colorful all ..
Race across America before you run out of gas! In this retro 2 player game you race from California to New York or Miam..
Make a racing light show with your fingers with our Finger Racers! 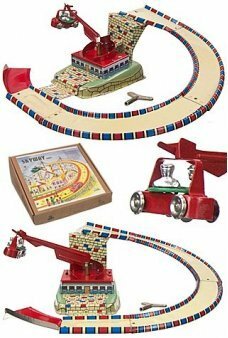 Just place a brightly colored LED race cars sha..
Our cute Wood Racer features smooth rolling wheels and racing stripes. 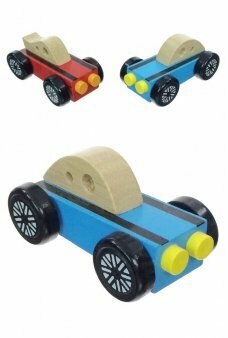 This nice little wooden car zips along with her n.. The Skyway Space Ride lifts the passengers for a fun and futuristic, round ramp ride. Just wind up the mechanical arm an.. 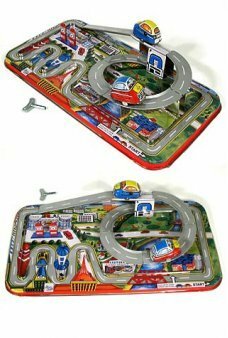 It's a tiny version of the original Hot Wheels Stunt Action Set with classic orange track and loop! The "Wor.. 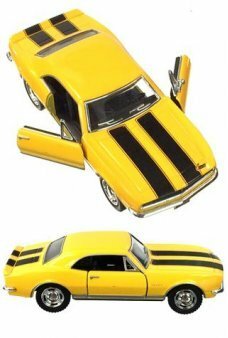 It's a tiny version of the original Hot Wheels Rally Case! 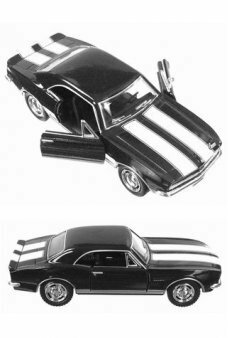 The "World's Smallest" miniature Hot Wheels Carrying Ca.. 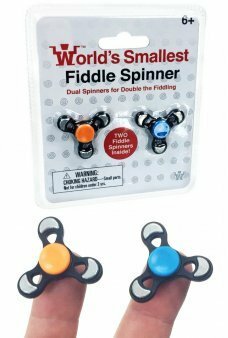 It's a tiny Fiddle Spinner, the popular finger spinning toy! 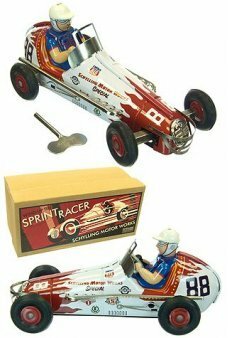 The "World's Smallest" miniature Fidget Spiiner car f.. 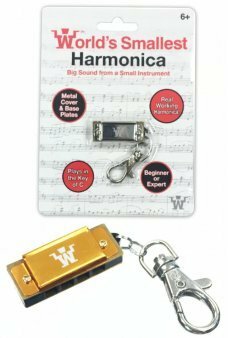 It's a tiny Harmonica, the popular pocketable musical instrument! The "World's Smallest" miniature Harmonica palys..